After hearing Clara Wieck (1835) and Franz Liszt (1841) Carl Reinecke decided that he wanted to be a pianist himself. On 16 Nov 1843 he debuted at the Gewandhaus in Leipzig. From 1846 until 1848 he worked as a court pianist in Denmark. During a visit to Leipzig he met Liszt, whom he visited in Weimar. Liszt advised him to go to Paris, where Reinecke met Berlioz, Heller and Gouvy. After he was offered a permanent job as at the Cologne Music School he was able to marry his fiancee Betty Hansen. In Cologne Max Bruch was among his pupils. He became friendly with Brahms and often visited the Schumanns in Düsseldorf. Shortly before he would become the conductor of the Gewandhaus in Leizpig he lost Betty. It was a heavy blow to him, but in Aug 1861 he married the singer Charlotte Scharnke, who had debuted at the Gewandhaus on 7 Oct 1860. They had two daughters and two sons. Charlotte died in 1868 and in 1872 he married for the third time. Margarethe Schifflin bore him two children. From 1860 until 1892 he taught at the Convervatory of Leipzig. Reinecke toured a lot and was especially succesful with his interpretations of Mozart. 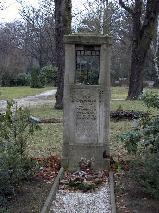 The grave of Carl Reinecke at the Südfriedhof, Leipzig.